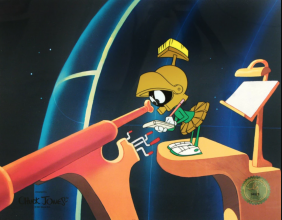 This Duck Dodgers in the 24 1/2 Century Title Card Marvin the Martian limited edition sericel by Chuck Jones captures a Daffy, Porky, and Marvin classic! Marvin hails from the planet Mars, but is often found elsewhere. He is often accompanied by his dog "K-9", and sometimes by other creatures (one gag, first used in Hare-Way to the Stars(1958), being candy-sized "Instant Martians" that become full-size on addition of drops of water). Marvin wears a Roman soldier's uniform, with basketball shoes. The style of these shoes resembles the Chuck Taylor All-Stars brand name, considered to be the "generic" or "standard" basketball sneaker. His head is a black sphere with only eyes for features. The curved crest of his helmet appears, with the push-broom-like upper section, to comically resemble an ancient Greek hoplite's or a Roman centurion's helmet. 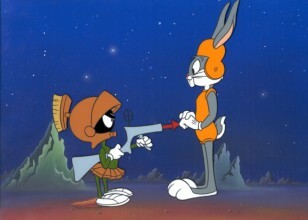 The appearance of the combination of Marvin's head and helmet allegedly led to Bugs Bunny thinking he was a "bowling ball wearing a spittoon" in one short. Marvin speaks with a soft, nasally accent, and often speaks technobabble. The helmet and skirt that surround him are green and his suit is red (in a few of the original shorts, his suit was green). He is also known for his trademark quotes "Where's the kaboom? There was supposed to be an Earth-shattering kaboom! ", "Isn't that lovely? ", and "This makes me very angry, very angry indeed." On numerous occasions, Marvin has tried to destroy the Earth with his "Illudium Q-36 Explosive Space Modulator" (sometimes pronounced "Illudium Pu-36" or "Uranium Pu-36"). Marvin always laboriously over-pronounces the name of the device, which resembles a stick of dynamite, in order to avoid any possibility of confusing it with some other similar form of explosive technology. Marvin attempts to destroy the Earth because, he reasons, "it obstructs my view of Venus"; he has been trying to destroy the Earth for more than two millennia, suggesting that members of his species, and possibly Martian creatures in general, have extremely long lifespans. The original reference to "Uranium Pu-36" changed to "Illudium PU-36" in subsequent cartoons. Marvin is consistently foiled by Bugs Bunny. 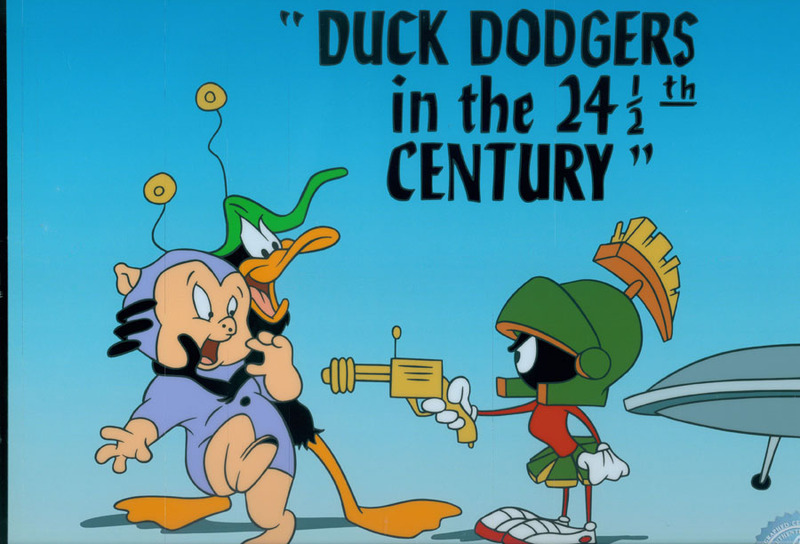 He has battled for space territory, Planet X, with Daffy Duck, a.k.a. 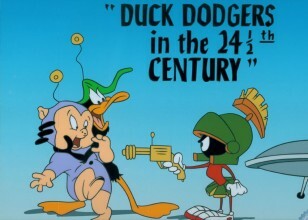 Duck Dodgers in the 24½th Century. 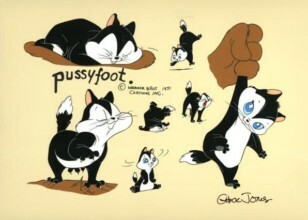 Charles Martin "Chuck" Jones (September 21, 1912 – February 22, 2002) was an American animator, filmmaker, cartoonist, author, artist, and screenwriter, best known for his work with Warner Bros. Cartoons on the Looney Tunes and Merrie Melodies shorts. He wrote, produced, and/or directed many classic animated cartoon shorts starring Bugs Bunny, Daffy Duck, Wile E. Coyote and the Road Runner, Pepé Le Pew, Porky Pig, Michigan J. Frog, the Three Bears, and a slew of other Warner characters.